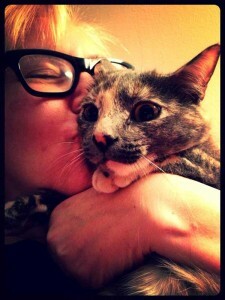 Filmmaker Marina Lutz gives her adorable cat Rosie a huge kiss. Lutz directed the heartbreaking autobiographical documentary The Marina Experiment. Currently, she is writing her memoir. I am writing my memoir, What I Did With My Life: the first 50 years, slowly and posting online at http://whatididwithmylife.com/. My intention is to cover my feelings about my father and how his behavior has affected everything I have done so far in my life. I have been describing it as “a hybrid creative non-fiction how-to self-hurt memoir narrative.” It will have lots more photographs from my archive, spanning through my punk rock years into adulthood. Embiggen: Click here to see a larger photo of Marina and Rosie. Watch: The Marina Experiment on the Underground Film Journal and read more — a lot more — at the Marina Experiment website. Read: What I Did With My Life: the first 50 years. Submit: Send in your own filmmaker photo with your cat.